For Math & Numbers, Ms. Rosaline's class has been working on creating a type of pattern called a tessellation. A tessellation is created when a shape is repeated over and over again covering a plane without any gaps or overlaps. Each of the shapes fit perfectly together like puzzle pieces. Tessellations can be found in nature, and have been utilized in Ancient Roman and Islamic decorative arts. 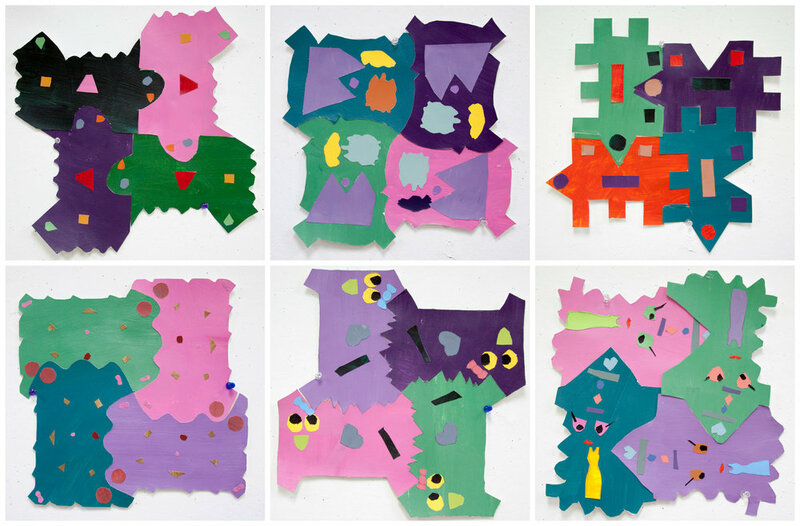 More contemporary examples of tessellations can be found in artwork by artists such as M.C. Escher. A rotational tessellation is a pattern where the repeating shapes fit together by rotating 90 degrees. The class discussed the importance of precision- the pieces must be exactly alike or will not fit together! Each student created their own template for their tessellation, and then traced and cut out the four identical pieces. Finally, designs were collaged onto each puzzle piece to transform it.